Soccer managers, unlike football, baseball, or basketball coaches, do not have meticulous control over their team’s minute to minute performance. All they can do is place their players in positions to make use of their talents. Here is FFG’s take on how Bob Bradley did in that respect, and though one of his choices may not have worked wonders, the manager comes off smelling like a rose. Why Jonathan Bornstein instead of Oguchi Onyewu/Carlos Bocanegra? In a word, speed. Since Algeria terrorized Slovenia and England down both flanks, Bradley must have thought that Bocanegra’s lack of pace and Onyewu’s prior mental mistakes would lead to an Algeria goal. Even though Bornstein looked like he was about to throw-up during the national anthem (a sentiment I and many other fans shared), he was quite solid. Chivas USA’s left back has rarely had a terrible 90 minutes through and through, but he always seems to make one howler per match. Fortunately, there were no such moments today. Bocanegra moved seamlessly to center back and may have been the man of the match. His presence calmed DeMerit, and Captain America always seemed to be present when a teammate made a mistake. Why Herculez Gomez instead of Edson Buddle? This is the one decision that puzzles FFG. While the striker didn’t have a poor game, he was used out of position. With Jozy Altidore constantly dropping towards the midfield, Gomez was asked to be the target forward. Using that tactic, Edson Buddle seems to be the better choice as a starter. Then again, Buddle did not look particularly sharp as a substitute and Gomez put himself in good positions when the ball was played to his feet. Perhaps during practice Bradley noticed that Buddle has finally lost his Midas touch. Why Benny Feilhaber instead of Stuart Holden? Feilhaber looked horrible in his pre-World Cup appearance against Turkey, and heading into the tournament FFG fully expected Holden to be the first midfielder off the bench. However, Feilhaber was decent against Slovenia and a world beater today. He was inspirational from the moment he came on, whether at left or center midfield. When Michael Bradley started to fade, Feilhaber even picked up the defensive intensity. Bradley the Elder deserves credit for getting the most out of the Brazilian-born midfielder. What formation was the US playing in the second half? As the half began, they stayed in their 4-4-2, with two slight changes. 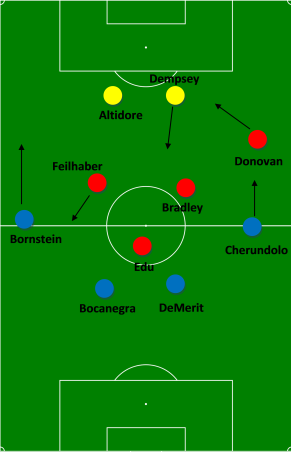 Feilhaber almost played alongside Bradley in attack (retreating to the wing when Algeria had possession) and Bornstein ventured much higher than he had earlier. 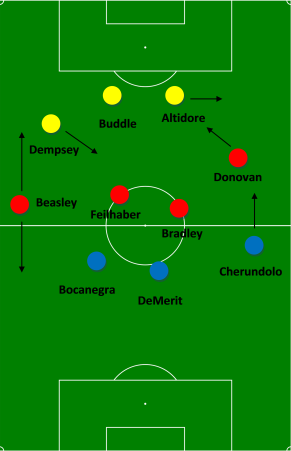 Once Buddle and Beasley were on, the formation essentially became a 3-4-3, though the US was still using a four-man line in defense, with Beasley covering left back. In each case, the changes were a success, as the Americans continued to threaten Algeria’s net. Why did it take so long to score? The gringos were not particularly clinical in the final third. Dempsey and Buddle were the worst offenders (not to take anything away from Dempsey, he was outstanding for the most part). Dempsey missed an open net (57th) and Buddle decided to pass to the goalkeeper instead of Altidore (89th). Also, a number of US shots went straight at goalkeeper Rais M’Bolhi, who managed to hold onto all but one. What happened on the goal? Um, Algeria finally decided to go forward. That’s what. Gringos, what do you think? Did Bob Bradley have a good game? Will the gringos be able to get away with poor finishing in the knockout round? Will Stuart Holden’s lack of playing time force him to seek a new career as a male model? Update: ﻿USA will face Ghana on Saturday at 2:00 EST. The commentators were saying something about yellow cards being wiped for the finals– does that mean the knockout rounds? Yellow cards continue until the quarter finals, ie if you pick up two yellow cards from your opening game to the quarter finals, you miss the next game. Once the semifinals begin, all yellow card tallies are expunged. This was done so no one would miss the final due to multiple-game yellow card accumulation. Players can still miss the final if they pick up a red or two yellows in a semi. Was a little dissappionted with Edu in the first half. Seemed to turn the ball over a lot. I thought Bradley junior had a solid game. He was a little more aggressive pushing up at times than normal, but it’s what had to be done. Cautiously optimistic about our “quadrant” in the knockouts: Ghana then Uruguay/Korea? This is starting to feel doable, but it will take brilliance and focus from head to toe. We can discuss this and more in next podcast! Yes, we should have another Podcast posted by late Friday or early Saturday.